My birthday is on the 23rd September and I have 1 sister. My favourite game is playing with a skipping rope. In Soutr Nikom life is hard for children like me. But sponsor me today and you can change my world for good. Panha lives in Soutr Nikom, Cambodia. 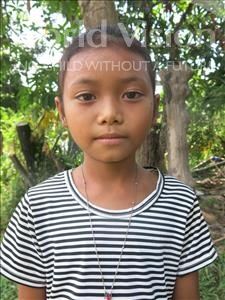 By sponsoring her, you can help her whole community, to make it a better place for children. For children like Panha, growing up in Soutr Nikom, malnutrition and waterborne diseases are everyday realities. Mothers aren't encouraged to breastfeed and miss out on life-saving pregnancy advice. Children struggle at school due to lack of teacher training, and often drop out. Your sponsorship can change Panha's world, and her community, for good.